Is there any area of your body where you want loose or sagging skin? Probably not - so you may be happy to know that there’s a non-surgical treatment option that can provide an immediate lift and/or plumping without incisions, general anesthesia or significant downtime. Mildly sagging skin can be lifted with specially designed, absorbable threads that are placed under the skin's surface. The threads are made of the same material as some of the absorbable sutures or "stitches" used in surgery, and collagen is stimulated along the length of threads before they reabsorb, producing results that last long after the thread is gone. Most of the threads used for cosmetic use in the USA are made of polydiaxone, which on average dissolve after six months, or poly-l-lactic acid, which dissolve over twelve to eighteen months. Skinspirations uses custom-made cosmetic threads made from polycaprolactone which don't dissolve for 24 - 36 months. 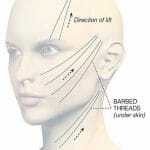 Absorbable facial threads can be divided into two main types: lifting threads and firming threads. Barbed, or cogged, threads have tiny barbs that are strategically placed to “hook” into the surrounding tissue to lift and hold it in place. Skinspirations uses barbed threads that have barbs pointing both up and down the thread to suspend sagging skin without the thread sliding. Thicker barbed threads are available that can even help lift breasts and buttocks. Smooth or mono threads have no barbs and are placed regularly under the skin to thicken and firm the treated area. Because they have no barbs to anchor them, smooth threads don't provide as much lifting as barbed threads but their mesh-like placement produces more firming than barbed threads alone. They can be used almost anywhere on the body where a small amount of traction produces desirable lifting. Popular treatment areas include brows, the jawline, cheeks, the upper neck, and knees. I started performing thread lifts in 2005, when only barbed, polypropylene thread lifts were FDA-approved. The results were impressive in most of our patients, but the company making the threads was acquired by another company, and the threads were no longer available after 2006. Since then, several types of absorbable threads have been developed to lift tissues, and the techniques further refined. How are thread lifts performed? After a local anesthetic is applied, cannulas each containing threads are inserted under the skin & directed to the area where slight traction or lifting produces the best results. The cannula is withdrawn leaving the thread in place. 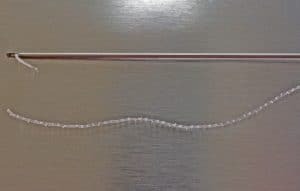 In the case of barbed threads, when the cannula is withdrawn, and the thread is slightly pulled, it causes the barbs to “hook” and lift the overlying skin. The excess thread is trimmed away and the tiny punctures heal within a few days. There's minimal swelling or bleeding and most patients say that they notice minimal discomfort during the treatment. The number of threads used depends on the patient's needs and the number of areas being treated. Results are seen immediately, but vary of course, depending on the patient’s degree of skin laxity and the number and type of threads used. The best results when treating the brow or lower face are obtained when downward pulling muscles are pre-treated with Botox Cosmetic or Dysport, to prevent potential dislodgement of the threads. In the USA, the threads available for thread lifts are absorbable, meaning they will eventually dissolve, but depending on the type, the results may last up to two years. Because the long-term results of absorbable threads depend on a robust immune response to stimulate collagen, the ideal thread lift patient is healthy and between 35 – 65 years in age, in general. There are three main types of absorbable threads used to perform thread lifts, all three of which are materials approved for use in the body by the FDA. Polydioxanone (PDO), of which some absorbable sutures are made, stimulate the production of Type I collagen but don’t provide much mechanical lift. Results may last up to six months. Poly-L-Lactic Acid (PLLA), is another absorbable suture material, as well as the main ingredient in the injectable skin stimulant, Sculptra. PLLA stimulates both Type 1 collagen and hyaluronic acid. Hyaluronic acid is important for skin moisture and firmness. The results of PLLA threads can last up to twelve months. Polycaprolactone (PCL) threads are the newest option, made of a material used for long lasting absorbable sutures. The longer duration of the material translates into more collagen and better support. Unlike the other two thread types, PCL increases both Type 1 and 2-collagen, as well as hyaluronic acid. PCL thread results may last up to eighteen months. Although thread lifts can lift and stimulate the skin, they do not provide the volume restoration that can be achieved with dermal fillers, and since one of the main causes of sagging facial skin is volume loss, the results of using both, depending on the individual’s face, usually provides a better over-all result. Thread lifts don’t remove redundant tissue like a surgical facelift can, so people with more than minimal excess skin or sagging are not good candidates for the treatment. Those with excessive sun damage, more than a moderate amount of facial fat, or leathery skin, also should consider other treatment options. Potential side effects of thread lifts include bruising, infection, soreness, bumps, temporary dimpling of the overlying skin and rarely, granulomatous reactions. Prices for thread treatments start at $600 with discounts given for multiple areas. If you are interested in learning more about how a thread lifting treatment can improve your appearance, schedule a complimentary consultation by registering online here or by calling 727-571-1923.